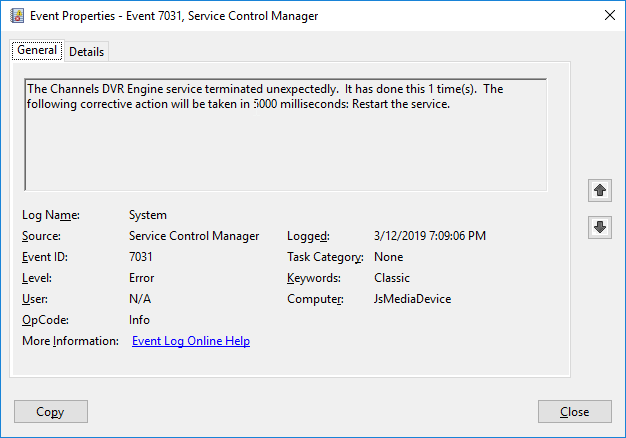 Starting on 3/12 I had a video driver issue while playing a game, comp froze and then restarted. I ended having to update my video drivers to get the game to actually display images again. After that happened I noticed that Channels DVR was constantly restarting the service. I tried uninstalling windows updates, restoring from an earlier database version for Channels DVR and it would just keep restarting. A a couple of minutes after each reinstall of Channels DVR it would start restarting the service for no reason. I even tried updating to the most recent and the Beta versions with no luck. Last night I decided to just do a new install without using a previous database and so for it has worked. But since it is a new database i don't have any of my shows that were recorded and now i would have to setup the passes again. Is there any way to import the data or does anyone know of a way to get the old databases to work. What does the Log file show? Since I've reinstsalled the old log file is gone. I'll resetup with one of my old databases and then take a look at what the log file says. I get a lot of that. I also just deleted the USA folders in that directory. Thanks for sending that over. I was able to track down and fix the bug. You can update the latest pre-release build with the fix by opening the DVR web UI, holding the SHIFT key on your keyboard, and clicking the Check For Updates button. After the update completes, try restoring the old backup and it should work. Looks like it is now working. It's updating the Guide Data and is now showing programs to be recorded. Also, it hasn't restarted..